FORT LAUDERDALE, Fla. — Signs of Esteban Santiago's unraveling had mounted over the past year. But it was not until early November, when he walked into an FBI office carrying an ammunition clip — leaving a pistol and his infant child in his car — to complain about a CIA plot against him, that his behavior became disturbing enough to earn him a short stay in a psychiatric hospital unit. In the months before, police were called repeatedly to his home about domestic disturbances, and the National Guard kicked him out because of "unsatisfactory performance" after nearly a decade of service. Santiago, an Iraq War veteran, increasingly spoke to relatives and associates about voices in his head that were tormenting him. 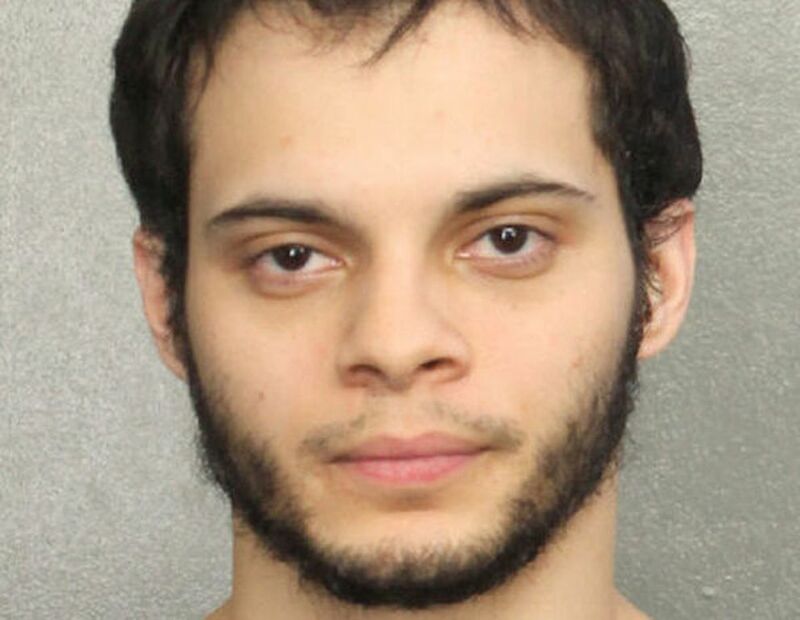 Then, a little before 1 p.m. Friday, Santiago, 26, turned up far from his Alaska home, in Terminal 2 of the Fort Lauderdale-Hollywood International Airport. There, law enforcement officials said, he retrieved his checked luggage, pulled a 9-millimeter handgun out of his suitcase and used it to kill five people and wound six others, setting off a panic that shut down the airport. Late Saturday afternoon, the U.S. attorney for the Southern District of Florida announced that Santiago had been arrested and charged on a federal criminal complaint "in connection with the deadly shooting of multiple victims at Fort Lauderdale-Hollywood International Airport." His first court appearance was scheduled for Monday morning before a federal magistrate in Fort Lauderdale. Law enforcement officials said they had not determined a motive or cause for the attack. And while they said they could not exclude the possibility of terrorism, the initial investigation suggested that Santiago had acted alone and that there was no evidence that he had terrorist ties. "It's way too early for us to really rule out anything," George Piro, the agent in charge of the FBI's Miami office, said at a news conference Saturday. "He said he heard certain voices, that the U.S. government wanted to enroll him in certain groups for ISIS, and he was very paranoid," Bryan Santiago Ruiz, an older brother, said in an interview Saturday in Peñuelas, the small town in Puerto Rico where they grew up. "He said that the CIA controlled him through secret messages over the internet and told him the things he had to do," he recalled. It was on Nov. 7 that Esteban Santiago went to the FBI office in Anchorage "to report that his mind was being controlled by U.S. intelligence agencies," Marlin L. Ritzman, the agent in charge of the office, said Saturday. "During the interview, Mr. Santiago appeared agitated, incoherent and made disjointed statements." Elaborating, a senior law enforcement official said Santiago had claimed that the CIA put terrorist propaganda on his computer. FBI agents called the local police, who took him to a psychiatric facility. "Santiago was having terroristic thoughts and believed he was being influenced by ISIS," said Christopher Tolley, Anchorage police chief, referring to the Islamic State. When Santiago went into the FBI office, he left a pistol and his newborn son in his vehicle, Tolley said, and he had an ammunition clip in his pocket. The senior law enforcement official, who spoke on the condition of anonymity because he was not authorized to discuss the case publicly, said the gun was the same weapon used in Friday's airport shooting. Police confiscated the gun but returned it to him in December, Tolley said. 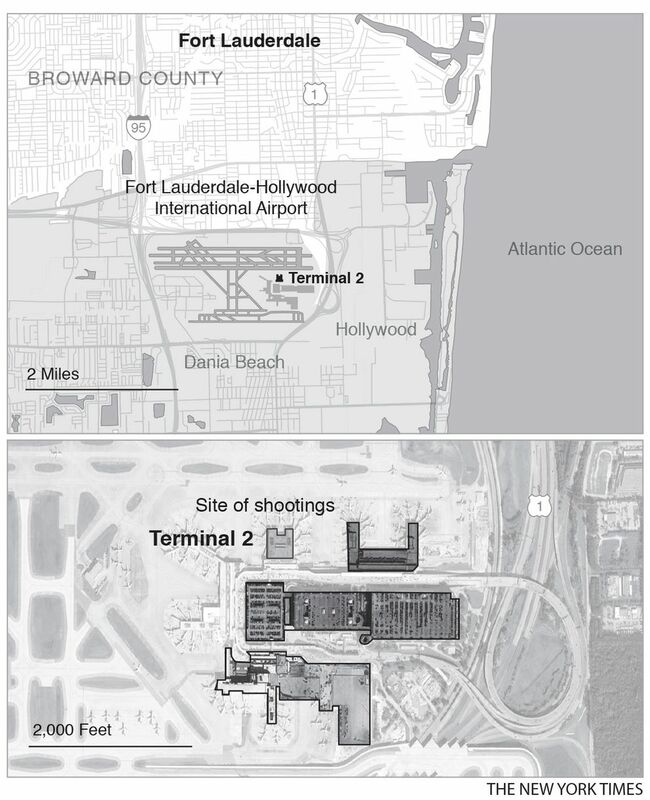 The Fort Lauderdale airport reopened Saturday, as the FBI led an investigation that sprawled across the country and airport officials tried to reunite people with what they said were 20,000 items that had been recovered from the terminal, left behind by passengers and airport workers fleeing for their lives. In 2010, Santiago was deployed to Iraq for nine months, working with the 130th Engineer Battalion clearing roads of improvised explosives and maintaining bridges, according to the Alaska Army National Guard. His company was awarded the Meritorious Unit Commendation. Guard officials said at least two members of the company were killed in insurgent attacks during the tour, but there is no record indicating Santiago was ever involved in combat. But family members said Santiago was never quite the same after his return. "After Iraq, something happened," Hernan Rivera, 70, Santiago's uncle, said Saturday afternoon as he stood in his driveway in Union City, New Jersey. "When he came back from Iraq, he was a different person." He described his nephew as a "normal kid" who enjoyed reading. "He was a person who used to talk a lot," he said. "And then when he came back, he kept to himself, he'd go to his room, he wouldn't talk to anybody." In 2014, he moved to Alaska and joined the Alaska Army National Guard. He got a job as a security guard and found a girlfriend 14 years his senior. A few months ago, they had a baby; a law enforcement official said it was not clear whether that was the same child he brought with him to the FBI office in November. Last January, the girlfriend told police that Santiago had flown into a rage while she was using the bathroom, broke down the bathroom door, and was "strangling her and smacking her in the side of the head" while screaming at her, according to a criminal complaint filed against him. A month later, he was charged with violating a court order to stay away from his girlfriend after police found that he had been living with her again. Tolley said that once in March and twice in October, Santiago was the subject of domestic disturbance calls, but each time, officers lacked the basis for making an arrest. In August, Santiago, who had reached the rank of private first class and had won several commendations for his earlier National Guard service — including the Army Good Conduct Medal — was discharged by the Alaska Guard for "unsatisfactory performance." Despite the disturbing nature of the episode with the FBI in November, it did not land Santiago on any law enforcement watch lists or on the federal government's "no-fly" list. Neither did it impede his right to possess a gun. At a news conference in Anchorage on Saturday, officials with the FBI and local law enforcement said that although Santiago was clearly incoherent during his encounter with FBI agents, he was not deemed to be threatening. In two other mass killings, perpetrators had drawn attention from the FBI before carrying out their attacks. Omar Mateen, who killed 49 people and wounded 53 others at the Pulse nightclub in Orlando in June, had fallen under FBI scrutiny twice for possible ties to terrorism. On Thursday night, Santiago boarded a flight in Anchorage, changed planes in Minneapolis on Friday morning, and flew into Fort Lauderdale. Law enforcement officials said he had a semi-automatic handgun in his checked suitcase and he followed all legal procedures for transporting the weapon. He went into a terminal restroom, took out the gun and loaded it, then returned to the baggage claim area and started shooting, officials said. He apparently acted alone, Piro said Saturday, and "the early indication is that there was no specific reason that he chose Fort Lauderdale International Airport, but we're still pursuing that and trying to really determine why he came here. "The suspect did cooperate with the interview team," which he described as a joint effort by the FBI and the Broward County Sheriff's Office. "The interview went over several hours and concluded sometime this morning." While people who knew Santiago recently saw anger, instability and paranoia, those who knew him earlier in his life had known someone very different. Relatives and acquaintances in Puerto Rico remembered him as being quiet and shy — so reserved that in his hometown, Peñuelas, on the island's southwest coast, few people knew anything about him. Workers at the barbershop, the bakery and the furniture store, and parishioners at the churches near his family's home, said they did not know him or his family at all. At the police station, officers said they did not recognize him from the photo that has been shown repeatedly on network and cable TV since his arrest. A neighbor of the family's, Carlos Cruz, a man in his 50s who has lived in the neighborhood his entire life, said he remembered speaking with Santiago just once. Rosemarie Zapata, 27, who attended middle school and high school with him, credited him with persuading her to join the Puerto Rico National Guard. At first, she failed the exam by 2 points, but it was Santiago who talked her into persevering and introduced her to his recruiter, she said. "He told me, 'Study, go, they will help us pay for college, so why don't you try it out?'" she said. He convinced her she could do it, saying, "You are going to defy all odds," she recalled. "He was very different," she said in a telephone interview from Puerto Rico. "He told me, 'You would never want to go to Iraq. I saw horrible things, horrible.' He was very different. He was sad." Delia Candelario, who went to Josefa Vélez Bauzá High School with Santiago, said he played basketball with the best-behaved boys, who always followed teachers' orders. "He was the most peaceful of all of them," she said. "He participated in classes and all that, but he was pretty shy." Another classmate, Joshua Ortiz, said Santiago was so quiet that when word got out that someone from their school had committed a massacre, hardly anyone could remember his name. Santiago and his friends were "never known to be involved in any problem or any fight during the whole time we were in school," Ortiz said. "We wonder, how could his life have changed so much for this to have happened?" José Hernández, who taught Santiago history at the school, said: "He was brilliant and did not show any indications of being disturbed. It's one of those strange cases. There are students who you expect mischief from, but not this one." Lizette Alvarez reported from Fort Lauderdale, Frances Robles from Key West and Richard Pérez-Peña from New York. Carla Minet contributed reporting from Peñuelas and Eli Rosenberg from New York.